A classic tale of love and acceptance from the Brothers Grimm is beautifully rendered in this magical retelling.Hans is an unusual boy. Born a hedgehog from the waist up, he knows what it’s like to truly be an outcast. Even his amazing fiddle playing can’t help him fit in. So Hans flees to the forest with his herd of loyal pigs and only his music to keep him company. But then a most unusual thing happens: When Hans crosses paths with two kings with two lovely daughters, his luck starts to change. 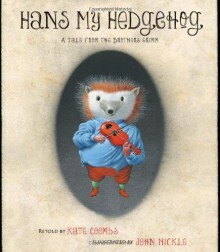 Will this lonely soul find true love after all?This lively and lyrical retelling of the classic Grimm’s tale, paired with lush, detailed illustrations, reminds us of the power of music, the importance of belonging, and the transformative effect of love. Enjoyable and fun, but both the retelling and the artwork were perhaps just a wee bit too cutesy for my taste. Still, seeing Hans in his underpants was hysterical! Good retelling of the Grimm tale. Attractive illustrations and design.